Great people make an amazing vacation! We just finished a week at Swell and wished we had stayed longer. We are total beginners to surfing, but met a few seasoned surfers at Swell. We were the only couple with mostly solo travellers and had a great time meeting people. This place is special; not just for beginners to learn how to surf, but it has just the right mix. Great instructors (Neno, Lee, and Ben), great team lead by Manager Haudy, and a great atmosphere. The owners, Clare and Jeroen have put a lot of thought and care into Swell. The brunches and dinners at Swell are amazing! And well earned after two surf lessons a day. Food around town (Gorditos, Vagamundo Waffles, and Casa di Papi on the beach) are reasonable and tasty. The camp itself is intimate, clean, and modern. Wifi in the rooms is weak, but we didn’t mind, as you could use it in the common areas, and made us more social. One word of advice: if you want to learn how to surf and get up, make sure you do the exercises Clare will send you. If you don’t, you will probably struggle. 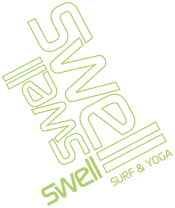 We have already recommended Swell to several people and hoping to make our way back soon! Book it; you won’t regret it.